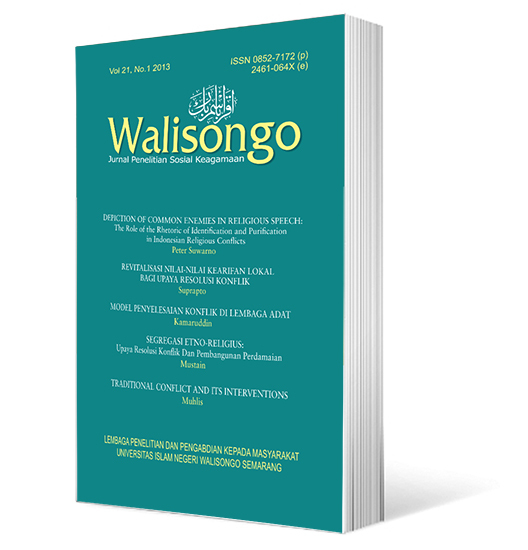 Walisongo: Jurnal Penelitian Sosial Keagamaan is an international social religious research journal, focuses on social sciences, religious studies, and Indonesia local wisdom. It is intended to communicate original research and current issues on the subject. The subject covers literary and field studies with various perspectives i.e. philosophy, culture, history, education, law, art, theology, sufism, ecology and much more. This journal is published by Institute for Research and Community Services (LP2M), Universitas Islam Negeri (UIN) Walisongo Semarang Indonesia and managed to be issued twice in every volume. We warmly welcome contributions from scholars and researchers of many disciplines. Walisongo: Jurnal Penelitian Sosial Keagamaan has been accredited as a scientific journal by The Ministry of Education and Culture, Republic of Indonesia, SK Mendikbud No. 040/P/2014. We warmly invite you to contribute in Walisongo: Jurnal Penelitian Sosial Keagamaan, an international social religious research journal. This Journal focuses on social sciences, religious studies, and Indonesia local wisdom. It is intended to communicate original research and current issues on the subject. The subject covers literary and field studies with various perspectives i.e. philosophy, culture, history, education, law, art, theology, Sufism, ecology and much more. The manuscript can be submitted through online submission at s.id/regwalisongo (must register first) and/or email at walisongo@walisongo.ac.id.